Growing up beets weren’t one of my favorite vegetables. In fact, I rarely ate it. It had to be prepared a certain way for me to be able to enjoy it. One with caramelized onions and the other would be in a herring salad. I am glad to say that my taste buds have evolved over the years. 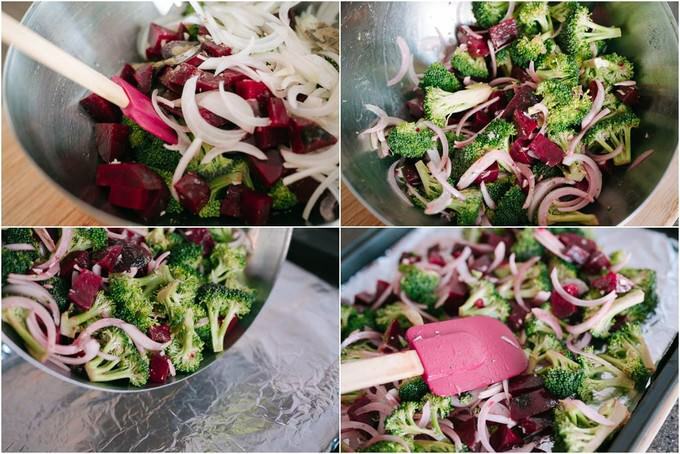 I love incorporating beets in salads, different dishes, or just saute it with eggs for breakfast. 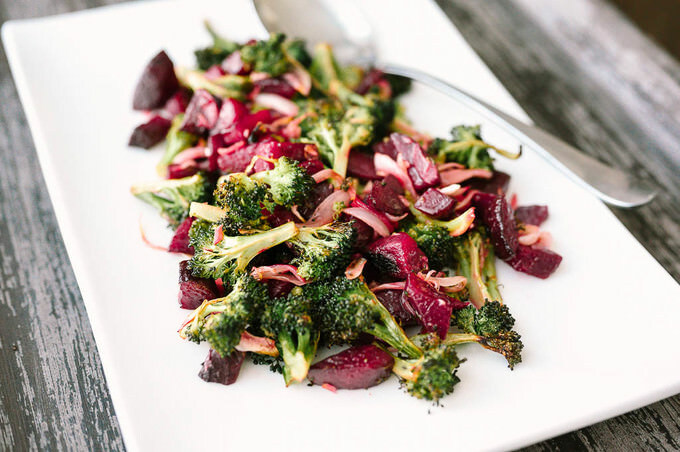 Originally this salad was developed by my sister, Kamola, whose husband really enjoys a vegetable side dish with almost every meal. Talking about balanced! I will be honest with you, beets cook for a long time! That is if you wish to cook it the conventional way. 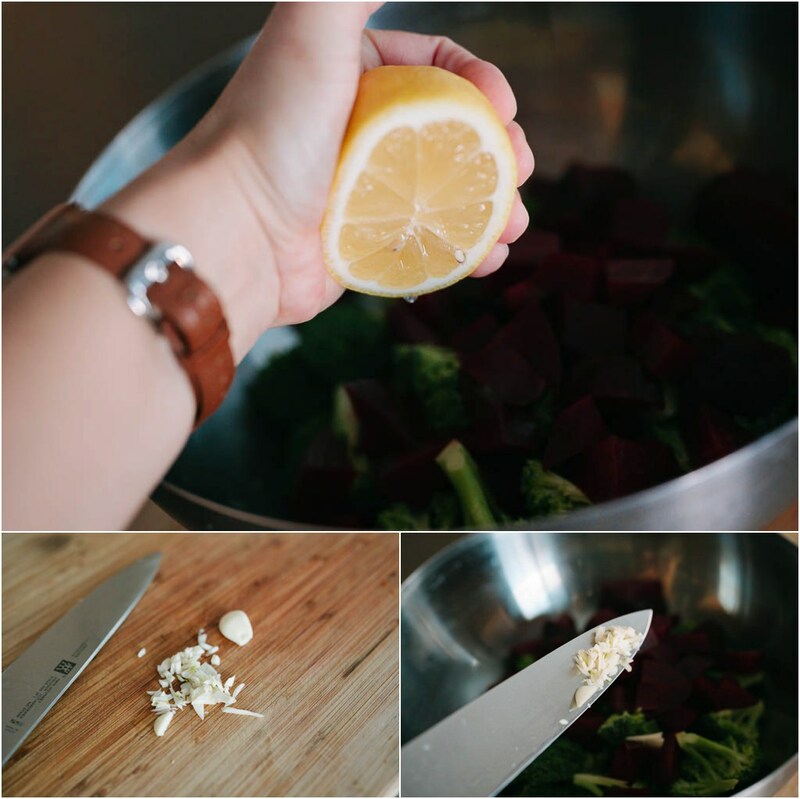 Over the years I have found that cooking beets in a pressure cooker is the best way of cooking it. First, you retain most of the vitamins. Second, the cooking time is cut significantly. 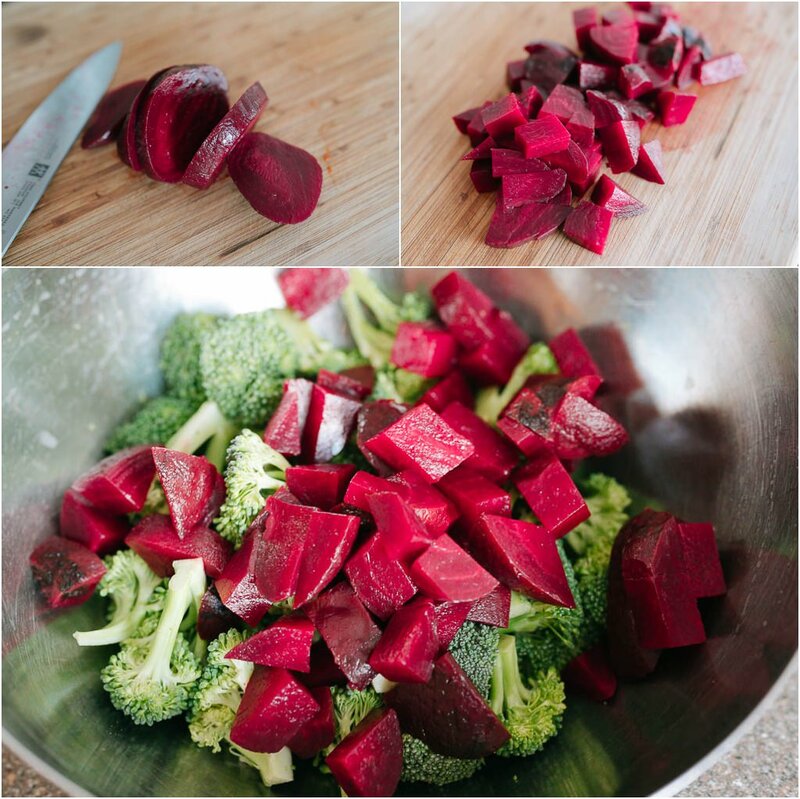 Either cook beetroot in the pressure cooker for 15 minutes or opt for buying them already cooked. Both ways work just fine. 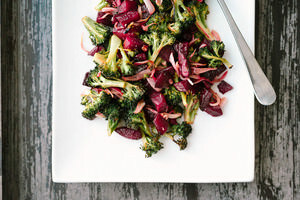 This particular recipe can use both cooked and uncooked beets, by the way. You do not have to worry about cooking it for this particular salad. 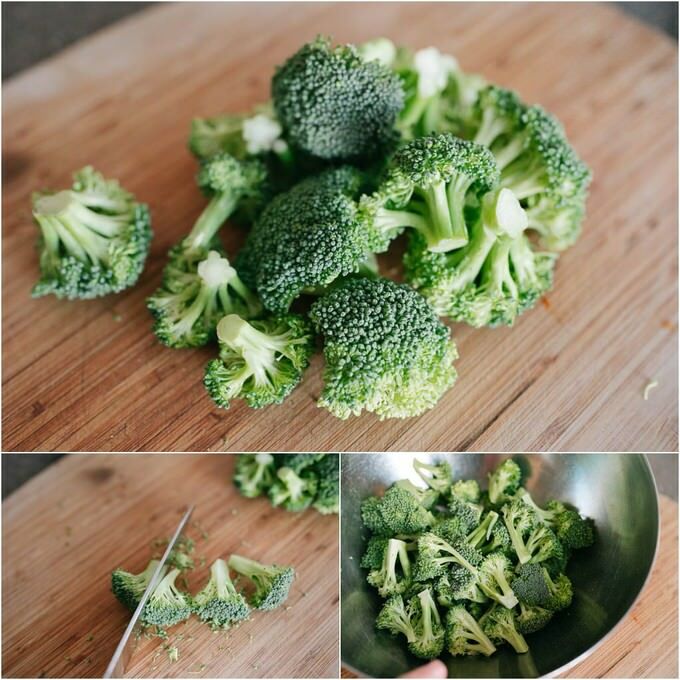 Cut broccoli in small florets and place them in the medium-sized bowl. 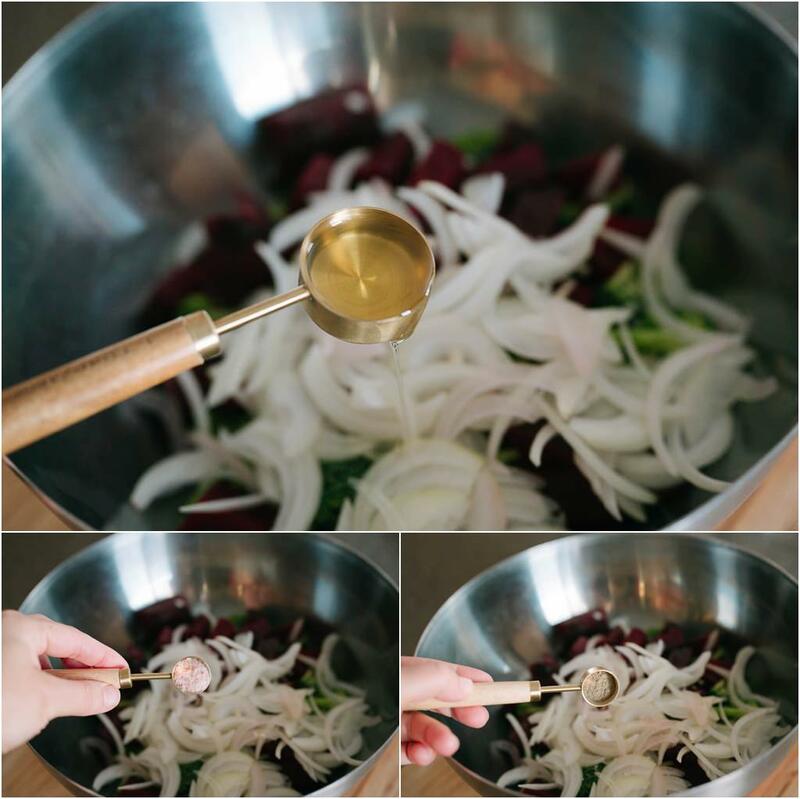 Cube beets in 2-inch chunks (they don’t have to be uniform) and place the chunks in the same bowl with florets. Roughly chop up garlic cloves and add to the bowl along with 1 TBSP of lemon juice. 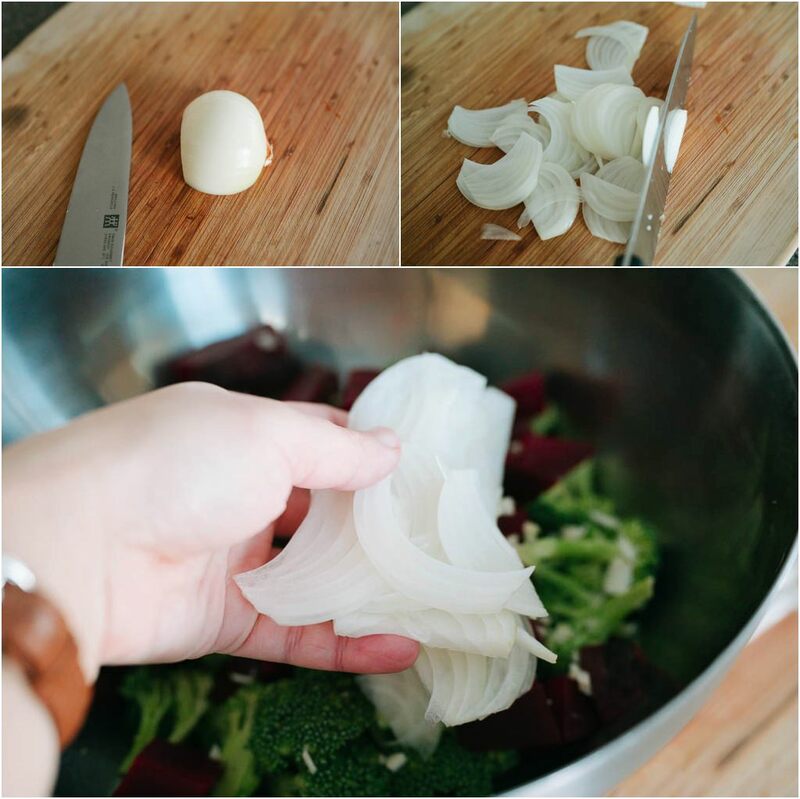 Slice medium onion into 1/4 of inch strips and add to the bowl. Add oil, salt, and pepper in the bowl. Mix all the ingredients well. 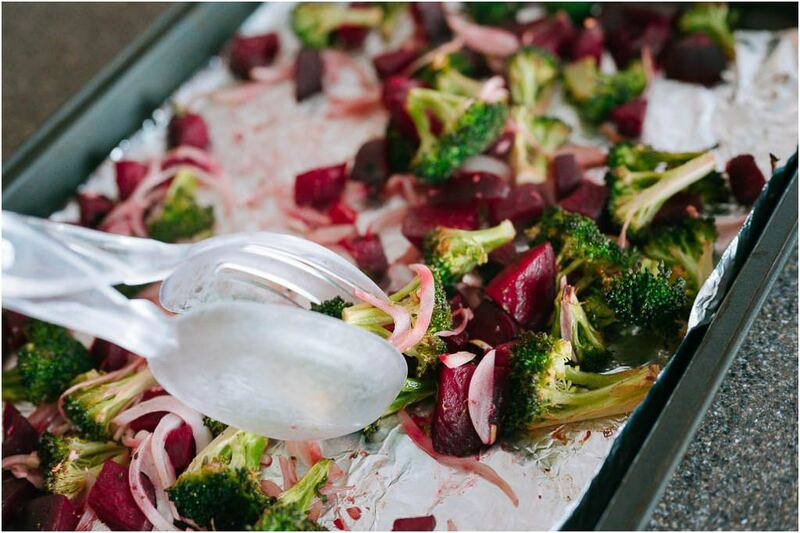 Place the vegetables on the baking sheet and spread them out. Turn the oven on and heat it to 400F. Positioning it in the middle rack, place the baking sheet into the well-heated oven for 15 minutes. Once the time is up, take the baking sheet out, mix the vegetables making sure all of them are getting even cooking and place it back into the oven for another 10 minutes. Once the time is up, your beautiful masterpiece is ready to be consumed. If you wish to adjust the seasoning do so at this point. If you have any questions regarding this or any other recipe, please feel free to let me know in the comments. I will get back to you as soon as I can.